This article is a review of cat toys that I have tried, or gotten references on from you, the readers. Thanks to everyone who sent in ideas and comments. Most of these have been tried personally by my expert team of cat toy testers, Spooky, Smooches and Baby Creatch. What I will report here is my impressions and theirs, combined with references provided by you. I hope this is helpful to you in picking out toys for your babies. I haven’t tried nearly as many toys as I would like to. This review will continue to grow as we are able to investigate more and also from your reviews and opinions, too! No, not the old “paper or plastic” deal. I’m talking about your cat toys! If you’re like me, you have lots of great playthings for your cat. Is this best for kitty? Well, yes and no. You can have a ton of toys, but if your cat sees them all every single day, he’ll get just as bored as a child with only one toy! Cats, being the intelligent, frisky animals they are, just love surprises, and are more likely to get into mischief if they get bored. All cat toys will lose their appeal over time, which is why I always tell folks to recycle your cat’s toys. After your kitty gets bored with one set of toys, take those away and re-introduce another set. Voila! Happy cat with “new” toys to play with! For more fun, when you store the older cat toys, throw them into a zip lock bag with a handful of catnip. When you bring these back out they will be most welcome indeed! The Thing in a Bag is an enclosed brown bag, about 8 inches long by 5 inches wide by 3 inches tall. It really looks like a lunch bag but is made of a claw and tear resistant material. 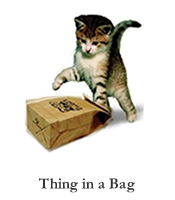 The Thing in a Bag cat toy vibrates with the help of a motor inside (battery operated). Sturdy Velcro holds the bag shut from kitties, but provides access for you to change batteries or throw a jingly ball inside. The thing I like best about the Thing in a Bag is the vibrations. They drive cats nuts! They keep trying to figure out what kind of critter is in the bag, and how they can catch it! Thing in a Bag can be set to vibrate continually, but the periodic vibration really seems to hold cat’s interest better. If your cats like to stalk more than pounce, try putting a string in the bag, closing the Velcro over it and dragging the toy around. They’ll love it! To avoid the risk of your cat eating the string, please be sure to take the string out when cat is not supervised. Also, this toy has a great feature—an internal timer that shuts the toy off cat after several minutes so you don’t have to worry about wasting batteries. I have to say this is one of the best cat toys. Lots of fun. I love this toy. 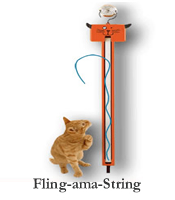 The Fling-ama-String is a tee shaped plastic toy with a revolving elastic belt. A piece of satin cord is sewn to the elastic so that when the belt revolves, the string dances enticingly and then disappears until the next revolution of the belt. Cool. It has an on/off switch with two different speeds (slow or fast) that allow you to control how fast the belt moves. The Fling-ama-String has an attached S-hook that hangs on any standard doorknob. A black heavy duty elastic strap slides under the door and easily loops on the doorknob on the other side and secures the Fling-ama-String in place. Three elastic loops on the strap allow you to achieve a secure fit so toy will not bang against and damage the door. No assembly is required. This toy requires 3 AA batteries (not included). I had mine installed on a closet door within 5 minutes. According to the manufacturer, this toy is “innovative, pure genius, amazing…if cats had money they'd buy one”. I have to say, I completely agree! It’s a fun challenge for cats to chase and try to catch the continuously moving string. Your cat will "catch" the string from time to time by biting, clawing or pawing, but don’t worry. When the cat lets go of the string, it will immediately start to rotate again. I’ll admit it. I was afraid that my cats claws might get stuck in the rotating elastic, so being the inquisitive cat lady I am, I took it out of the box right there at Petco, and investigated. First off, the elastic rotates from the top down, making it unlikely for any little claws to get caught, and second, the elastic is strong, but it would not stand a chance against a sharp claw. Yup. It’s awesome. 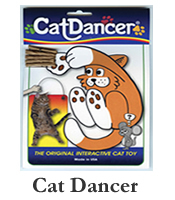 The Cat Dancer is the original interactive cat toy. Spring steel wire and rolled cardboard create an irresistible lure for cats and great fun for cat lovers. Home-tested by over 8 million cats. Ok, this toy seems so simple it’s hard to believe our cats would go so crazy over it. All three of my feline associates have played with and totally loved this toy! Not only are they all three interested in it, but our resident “Glamour-Puss”, Smooches actually has jumped up for this one, a very rare event indeed! Practically indestructible, this is one toy that the cats I know never get bored with. It’s great and it’s cheap. Buy it and your cats will thank you! 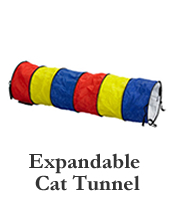 The Expandable Cat Tunnel is a cat toy that is fun and helps get cats to exercise more. Each section of tunnel is about 3 feet long and cats are immediately drawn to it. You can stop at one section, but when you see your cat react to it, I know you’ll be as tempted as I was to get more. It’s just wonderful to see how cats run through the tunnel, take and hide their toys inside and even sleep in there, too! From references I’ve gotten, even sedate, older cats wind up getting in on the fun and exercise more because of this cool toy. Did I mention that inside the Expandable Cat Tunnel there is even a little fluffy ball that hangs down for your cat to play with? 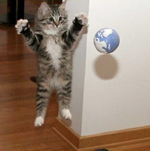 You can do as I do and spray this ball with catnip spray and really treat your cat. 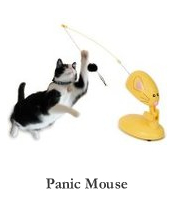 Panic Mouse is a interactive cat toy with computer-generated patterns that mimic lifelike random "mouse" movement. It requires three AA batteries (not included). The Panic Mouse is bright yellow, looks like a mouse and the wand is the “tail” of the critter. It was very easy to assemble, and it’s fun. My cat goes crazy stalking it every time I bring it out for him. I love that when I need a cat-sitter for a while when I’m busy, all I have to do is turn this thing on and it’s cat heaven for at least 10 to 15 minutes! The Panic Mouse has adjustable height, angle, and speed and computer chip generated action with random movement. It is set on a heavy-duty plastic base with stabilization pieces out to the sides that keep in up and playing. Since this toy is going to get a lot of use, it’s nice to know that it has a removable wand for human-cat play and that replacement parts and mouse variations are available. Oh, such fun! 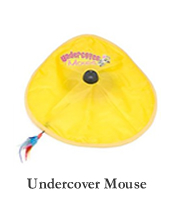 Beneath a durable nylon cover a hidden mouse scurries in all directions, tapping into your cat's wildest instincts. All my kitty test team members love this. Spooky leaps on it right away, and Baby Creatch just watches for a while, calculating until she feels the time is right and then makes a mighty POUNCE! Schmoo likes to lay on the ground next to it (Being careful not to muss up her fur) and swat it whenever it goes by. All of the team like it a lot though. There are different speeds, as well as our favorite, “Random” mode. Heck, half the time I turn it on just for MY entertainment! It has proven to be well worth the investment, and an extremely good value! Another fun hide and seek cat toy. These cubes can be used separately or connected to each other with Velcro strips (included). Varying according to manufacturer, these can be found open on either three or four sides. Materials vary also. My favorite is kind of a parachute material. The soft fabric ones are nice, too, but I have found them to be less durable and they don’t have that kind of swishy sound that parachute material does. Sometimes sold singly, the solo cube should cost no more than about $7.00 (USD). In any case, these are terrific to play with your cat. 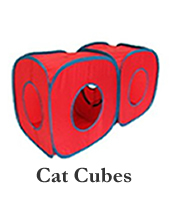 Using fishing toys, watch how the cat will hide inside the cube until the right time to pounce! For a fun variation, let the fishing lure rest gently on top of the cube, on the closed part. It is great fun to watch your cat get into the cube and smack the roof with his paw to make the mouse jump off! My cat sleeps in his, sneak attacks from it as home base, hides his toys in there and more. Such a fun item for a low price! I say get it. I know you will love this one. So, my fellow cat lovers, this is only the beginning. I will continue adding new toy reviews as long as there are cool new toys to try! But that’s not enough. You, my feline fancying friends are all cat experts and have valuable experiences to share. I’d love to hear from you, and be able to share your stories and reviews right here. I've included an invitation for you below. Also, for more cat fun, check out my page on Cat Play . You'll find lots of great ideas and tips for playing with your cat! Well, folks, that's it for now. Till the next new cat toy, be happy, play hard and live like a cat! Learn all about Cat Play here! Have you found a great cat toy? What toys are your cat's favorites and why? Share it! (The maximum image size accepted is 800x600. If your photo is larger, you may resize it by using a graphics program or online photo editor such as Picnik. Click below to see cat toy reviews and stories from other cat lovers like you!